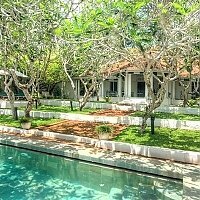 Climb the leafy road for 5 minutes out of Galle town into the city's desirable residential area overlooking the harbour. 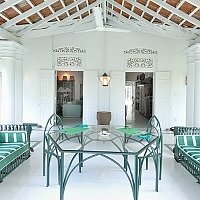 Here are 2 marvellous colonial homes reborn as boutique hotels. The Sun House`s welcoming courtyard houses a few vintage cars to tour guests around the city. Each of the flawless suites looks onto the immaculately kept frangipani and hibiscus gardens. The sitting room is a large and cosy setting for pre-dinner drinks, a book from the large library or admiring the antiques and art by Saskia accompanied by light music. Step out onto the terrace and down to the sun-loungers that surround the infinity pool. Your host has created wonderful interiors and ensures her team of efficient staff will exceed your service expectations. Just next door, guests can enjoy further luxury and privacy at Doornberg. Once a boys' orphanage, this large colonial villa curls around the well maintained croquet lawn. The discreet and friendly staff ensure your privacy yet provide a very relaxed and unpretentious atmosphere. The Dutch House infinity pool serves just 4 suites and guests can also relax on their private terraces. A range of sophisticated accommodation from deluxe doubles to private suites. An excellent chef with a daily menu changes. In-suite massage after a day in the hot city can be the perfect aperitif to dinner. Dining is occasionally a group affair and will disappoint romantic couples desiring candlelit privacy, especially Doornberg guests. Join in the sociable spirit and savour the romance. 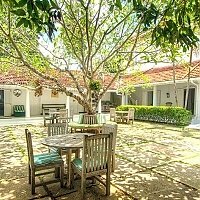 Despite, the villa's luxury, Galle has little to offer beyond a 2 day stay and guests may prefer to move onto a beach villa. The six rooms are well dispersed around the garden and the balconies are shared. 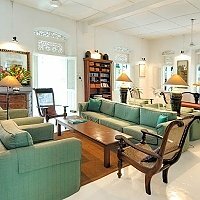 The rooms are beautifully decorated with bright Asian fabrics and Dutch antique furniture. The white painted wooden floors and high ceilings are cool with shuttered windows to the gardens. 3 large standard rooms; "˜Kingfisher' and "˜Sun and Sky' have 4 poster king-size beds, and twin beds within "˜Parott Fish'. The en- suite bathrooms have been recently refurbished showing Henry's design flair, but we have not yet had an opportunity to view them. Each has a shower and a range of compimentary toiletries. Kingfisher's bathroom is adjoining with no connecting door. Writing sets and maps of Galle on recycled paper are a welcome sight for those who like to "˜keep in touch ` the traditional way. The deluxe "˜Hibiscus' room is a little larger, air-conditioned and enjoys an open-air shower -listen to the birds and follow the shooting stars. The deluxe "˜Aralayia' room has a superb garden view but is situated next to the restaurant and whilst noise is well contained, it can still be a little annoying. The "˜Cinnamon' suite is delightful and occupies the entire first floor. The private sitting room/library overlooks the surrounding hillside and forest. One end opens out onto a private balcony. 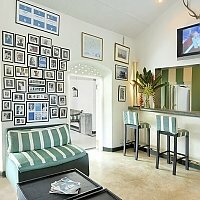 All the deluxe facilities and private dining are available to Cinnamon guests. 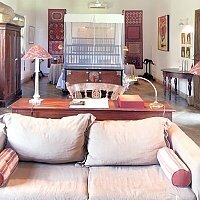 The main villa is extremely comfortable, with a luxury sitting room and library extension. The veranda leads you around the extensive lawn to each of the 4 luxury suites. Small pantry kitchens are accessed from the veranda for any guest who wishes to make their own cocktail or cup of tea. The "˜Ballroom' is the largest and most elegant suite. A grand entrance through huge temple doors, to a sitting area facing out to a private terrace. Proceed through the whitewashed archway to the forest green and scarlet silken bedroom, with its sumptuous, emperor-size 4-poster antique teak bed, complimented by tall teak and ebony tea chests, wardrobes and writing desks. To the rear of the bedroom, screened by a partition, lies a luxurious bathroom. Side- by- side are twin baths standing on claw feet. 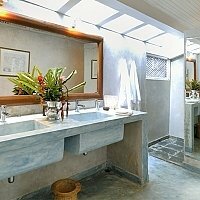 Beyond are beautiful basins and a mirrored vanity area, piles of fluffy white towels and an open-air shower courtyard. The remaining 3 suites are slightly smaller but equally luxurious and have open terraces onto the lawn. Each has a luxury bathroom with bath and open-air stargazing shower rooms. 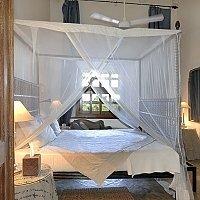 Mosquito nets, air conditioning, luxury toiletries, writing sets and a personal housekeeper are standard throughout Doornberg. Dining is a sociable affair in the central dining room of the Sun House. Where the management feel that the guests are well suited, there is a Sri Lankan Dinner party for all guests to dine together in the large diing room. Chef-Mary's delicious Sri lankan curries are the focus on these evenings. The Sun House menu changes daily and is inspired by a fusion of Asian flavours and cooking styles. Produce is sought from organic, local seafood and Hill Country specialists. There is a choice of starters and desserts but the main course is set. Guests can request an alternative in the morning if it is not to their taste. Crispy pork fillet with sweet and sour tomato and pineapple sauce served with basmati rice and saute spinach. White chocolate and vanilla tart with chocolate pastry. But other exciting temptations include a fantastic range of curries, Red Curry marinaded Mahifish fillet wrapped in banana leaf, Spicy noodles and chilli calamari, and sumptious puddings like Pandanus Pancakes rolled in caramalized pineappple, Banana fritters and ginger icecream etc etc.ummmmmm! The gardens and cinnamon patio allow guests some privacy on other days for dinner a deux. Sadly the very reclusive guests from Doornberg must visit the Sun House to dine. On request, guests can dine on their terrace. Breakfast is a choice of Western or Sri Lankan and is included in the room tariff. Lunch time snacks of bites, sandwiches, pasta and salads are also available but many wish to explore the many eateries of Galle Fort. f you fancy a change of scenery, Galle has numerous cosmopolitan restaurants with adjoining cocktail bars. The 2 villas have a collection of vintage cabriolet cars. On request a driver can plan a tour around the Galle shops, Fort or to the beaches of Unawatuna or Bentota. Head North around the coast and you will pass many villages worth an hours viewing - craft making, puppetry, masks, antiques, turtle farms. 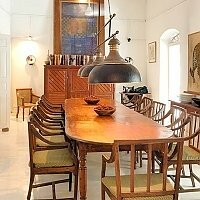 The inspiration to many colonial villas was the late Geoffrey Bawa, reknowned architect. 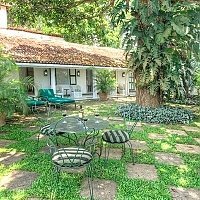 His original home "Lunaganga" and brother, Bevins wonderous "Brief Gardens" are open for viewing in Bentota. Drivers to destinations further afield can be arranged for $30-$65 a day. In- house yoga and spa sessions can be arranged. An experienced teacher/masseuse from the south coast is on hand for in-suite/garden sessions although a treatment room is not yet built. 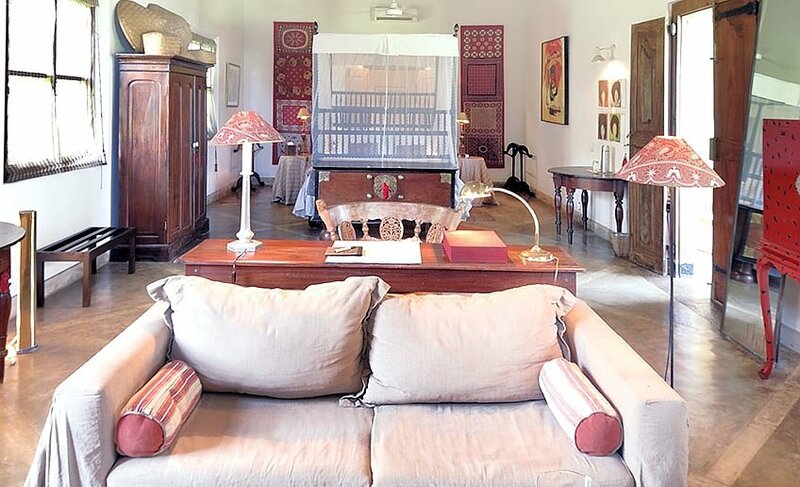 Galle is steeped in history and the ramparts and museums will test your history for a day. Stroll into the Fort and try out the many wonderful cocktail bars and eateries. Art galleries and antique shops are tucked away in the side streets but exhibit some wonderful pieces at fantastic prices. If you have a short stay but fancy diving during Dec- March, Unawatuna is a great place to start and the reef is as colourful for snorklers too. 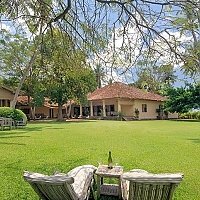 For further recommendations on places of interest, activities, restaurants and local transport in Galle and the South Coast, click here.